Because your privacy is very important to us, we have developed this privacy statement in order for you to understand how we collect, use, communicate and disclose and make use of personal information. The following outlines our privacy statement. We are committed to running this website and conducting our business in accordance with these principles in order to ensure that the confidentiality of personal information is protected and maintained. This website has no hidden connections to third party websites like advertising partners. For payment, this website may direct you to a payment provider. Required payment information, like address, amount, order details, that the visitor has entered on this website may be shared with this payment provider. The visitor of this website should consult the privacy statement of such third party websites and agree to it to complete a payment or leave the third party website. This website will take all reasonable technical and organizational precautions to prevent theft, misuse or illegal alteration of the data you sent to us by website forms, email or otherwise. The data is stored on our webservers which are located in The Netherlands, and at the company address stated below. This website provides SSL to allow visitors to access this website using an encryption connection. Your personal data will not be sold, rented or leased to third parties. We may use your personal data to inform you of news regarding this website, including its services or offers. Every such information is accompanied by a message how to opt-out from this information. Like most other websites, this website makes use of log files. These files are used to record all kinds of information related to the site, this is a standard procedure for most websites. The information inside the log files includes date/time stamp, IP address, browser type, page viewed, referring/exit pages, and data entered during form submisssion. This information is used to administer the website, solve problems, generate website statistics including demographic information. This information is not used to track movement of a visitor around the website on an individual basis. By using this website the visitor hereby consent to our privacy statement and agree to its terms. This privacy statement is effective as of September 20, 2014. 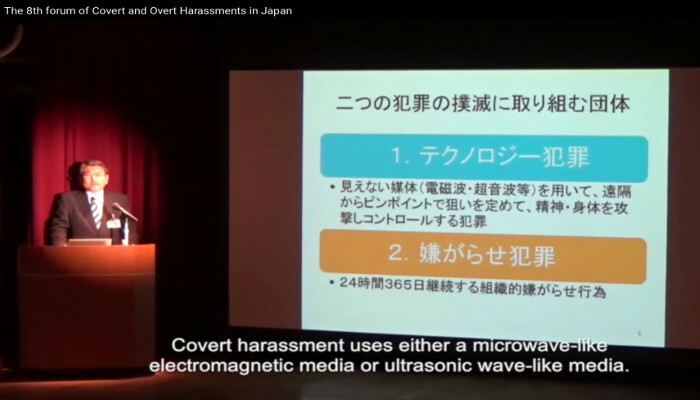 6 mar 2016 Video of our 8th forum of Covert and Overt Harassments in Japan with English subtitles. By Mr. Terukatsu Ishibashi, the Chairman of the board of directors of Technological Crime Victims Network Specified Nonprofit Organization. 22 Dec 2015 Harald Brems of the Initiative Gegen Elektromagnetische Folter (IGEF), at the Covert Harassment Conference 2015: 1) Lecture, 2) Interview, 3) Reflection. Thank you so much Harald for helping to organize the conference and being a speaker! Read on raum&zeit website >. 20 Dec 2015 John Hall at the Covert Harassment Conference 2015: 1) Lecture, 2) Interview, 3) Announcing TARGETED, The Movie, 4) Reflection. Thank you so much John for coming to the conference! 20 Dec 2015 TARGETED. Based on true events. Adapted from Dr. John Hall's book A New Breed - Satellite Terrorism in America. 29 Nov 2015 This is an update regarding the delay with the videos from the Covert Harassment Conference 2015. We have completed editing all speakers talks and will start uploading the videos this week. Sorry for the delays ... this is what happened. This year, we outsourced the recordings of the lectures. We were meant to receive the conference videos immediately after the event and, also, we were meant to receive edited videos one month after the conference. Unfortunately, both agreed points were not met. When finally, after over one month, we received our videos, many of them appeared to be of bad quality and some fragments were missing. Despite disappointments, we started to work on editing them ourselves. Is it possible to hack a human being? It is possible to modify his behavior, alter his personality, read his thoughts, implant dreams, memories or ideas in his brain, make him hear voices or pronounce phrases... force him to act against their will, even force him to commit suicide? Experts say that, with currently available technology, and the convergence between neuroscience and electronics, this is all already possible. Since the experiments of Dr. Jose Delgado in Yale University, in the 60's and 70's, mind control techniques has become one of the main areas of interest for secret services and the military. And thousands of people, in the United States, in Europe, and spread all over the world, claim to be victims, targeted individuals, used as guinea pigs, in large scale experiments to verify the effectiveness of these techniques. Those affected by these non consensual trials are starting to group into associations, demanding official investigations that determine who is behind these experiments. Their stories sound like science fiction, and are often rejected, or ridiculed, but the symptoms they explain corresponds with techniques that have been investigated at some point by scientists, and form part of scientific research currently underway, or carried out in recent years. Developed by neuroscience labs and research centers from some of the leading universities in the United States, many of this trials has been funded by DARPA (the Agency of advanced research for America's defense) and protected by military secrecy. Many of the patents which have been derived from these investigations are part of the list of the so called "black patents", restricted by its strategic interest, and not accessible for the public. If you want to be in this Remote Control Pedro Barbadillo film, send an email to beata@xs4all.nl or peterpm@xs4all.nl. How did it feel for Stocco to have someone else's brain control his own hand? 15 Oct 2015 Unique interviews from the Covert Harassment Conference, 1-2 October 2015, Berlin, broadcasted by Jim Fetzer's The Real Deal: 1) Kevin Barrett and Nick Begich, 2) Kevin Barrett and Ole Dammegård and Olle Johansson, 3) Kevin Barrett and Peter Mooring. 12 Oct 2015 Demonstration on Sunday 18 October 2015, 4pm, Oranienplatz, Kreutzberg, Berlin. Organized by attendants of the Covert Harassment Conference 2015. For more information contact Aaron aabutoboul@yahoo.com. If we don't act now it may be too late for future generations. Please print the flyer, two sides, and take it with you. Please share. 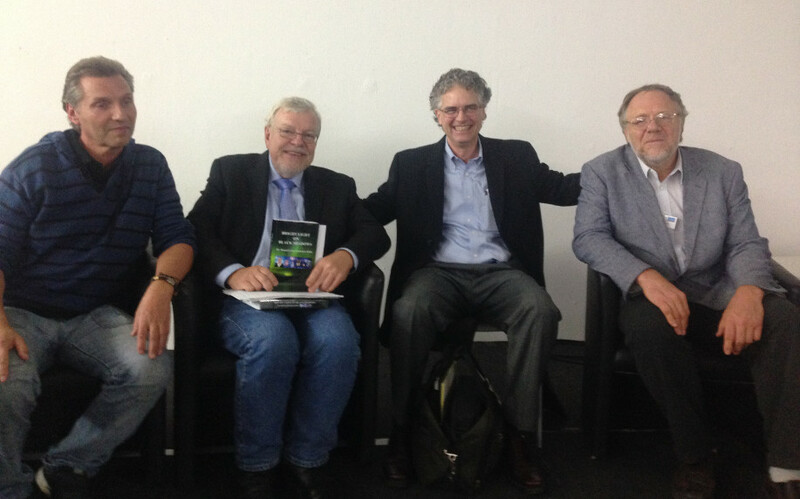 12 Oct 2015 Thursday, 10/08/2015 False Flag Weekly News - Kevin Barrett and Jim Fetzer about the Covert Harassment Conference 2015 in Berlin. IS OBAMA 'WEAPONIZING' VULNERABLE CITIZENS? 5 Oct 2015 Thank you so much! The conference took place, we had some 130 participants (excluding speakers), few journalists and doctors, most were TI's. We had visitors from Germany, Poland Czech Republic, France, Netherlands, Japan, Russia, Ireland, Sweden, Bulgaria, Italy, etc. We understand that for most TI's it is very difficult to come. For this it is almost impossible to express our gratitude to all who came. We also want to thank our speakers, without them, the conference would not have been possible. Thank you Nick Begich, Mojmir Babáček, Ole Dammegård, Kevin Barrett, Olle Johansson, John Hall, Henning Witte, Mečislav Chorzempa, Rick Simpson! The participants list will be send soon, we will put the lectures online in 1-3 months (please be patient) and will contact everyone who sent us messages. This conference is not over yet! From our hearts we thank you. 1 Oct 2015 NTV with Janusz Zagórski present at the conference to record the presentations and do media coverage. Janusz is running the internet TV station NTV in Poland and active in exposing facts about mind control. 25 Sep 2015 We received information from Mr. Lucas Pomeroy and decided to put this online and at the same time start our investigations into this. 24 Sep 2015 During the conference the book of late MD Rauni Kilde "BRIGHT LIGHT ON BLACK SHADOWS"* published in March 2015 in Canada will be available. Ask organizer Beata Zalewska. 23 Sep 2015 Newsletter 22 Sep 2015. 19 Sep 2015 United States Army Veteran Robert O. Butner: The CIA and contractors use no touch torture tech. on vets too. From his website http://www.rob-files.com: This case is typical of many 'technical crime victims' labeled 'targeted individuals' and their families. 15 Sep 2015 We are pleased to announce that Dr. John Hall will be speaking at the Covert Harassment Conference 2015. 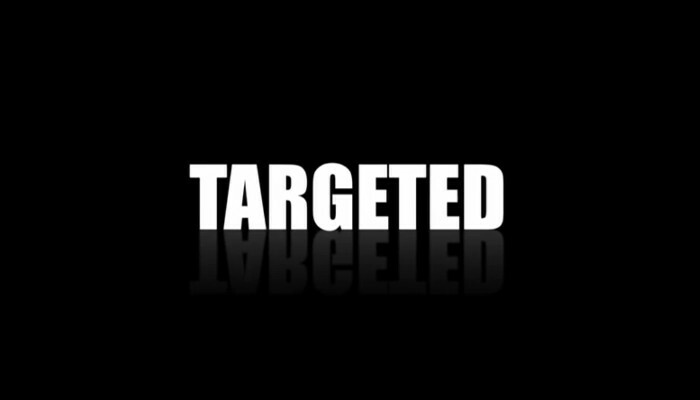 Title of John's lecture: Who are the Targeted Individuals? 10 Sep 2015 We are pleased to announce that Prof. Olle Johansson from the Experimental Dermatology Unit, Department of Neuroscience, Karolinska Institute, Stockholm, Sweden, will give a lecture on "Adverse health effects of modern electromagnetic fields from wireless telecommunication, such as mobile phones and WiFi". or watch the video: Prof. Olle Johansson on WiFi - "Irreversible sterility within five generations"
9 Sep 2015 Ole Dammegård on tour in September and Oct 2015, speaking also at the Covert Harassment Conference 2015! 8 Sep 2015 About microwave, EMF, satellite or even HAARP technology, plus on-the-ground operatives, to stalk and harass people. 7 Sep 2015 Unfortunately, due to serious (leg) injury Carl Clark cannot come to the conference. We visited Carl and did an interview with him parts of which will be shown during the conference. We wish Carl prompt & successful recovery. 4 Sep 2015 Newsletter 4 Sep 2015. 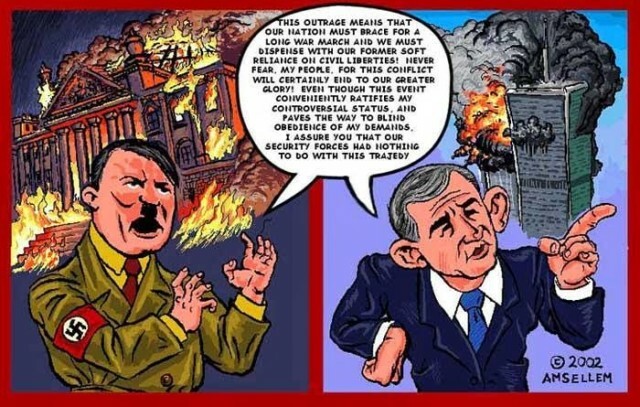 Brilliant artist David Dees expresses his support to the conference by sharing his art with us. Please download, share, print, distribute. 2 Sep 2015 We are proud to announce that Dr. Kevin Barrett will media cover our event and also will be speaking at the Covert Harassment Conference 2015. 28 Aug 2015 CHC2015 Press Release available in English, Deutsch (German), Polski (Polish) and Francais (French). Please use link or send PDF to journalists, media, etc. Jim Fetzer is a former Marine Corps officer, who has published widely on the theoretical foundations of scientific knowledge, computer science, artificial intelligence, cognitive science, and evolution and mentality. 10 Aug 2015 Press release: INTERNATIONAL CONFERENCE ON COVERT HARASSMENT EXPOSES INHUMANE MIND CONTROL EXPERIMENTATION AND ROBOTIZATION OF HUMANITY . 8 Aug 2015 Newsletter 2 Aug 2015. 28 Jul 2015 Buy your tickets now. Very reduced price for TI's..
14 Jul 2015 Newsletter 5 Jul 2015. 28 Jun 2015 Summary programme updated Programme 2015. 15 Jun 2015 The summary programme is online: Programme 2015. 11 Jun 2015 The conference location has been arranged: Link to location, hostels/hotels. 1 Jun 2015 CHC2015 is organized by: STOPEG, EUCACH, IGEF, STOPZET. See also below. The 2015 conference is dedicated to the memory of Rauni-Leena Luukanen-Kilde who was a speaker at the 2014 conference. She passed away 8 February 2015. Rauni was a real fighter and inspired many of us, thank you so much Rauni. 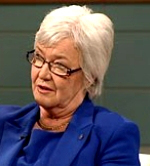 Her last words at the 2014 conference:Video >. Rauni's lecture: Bright light on black shadows, man is a mind, not a body >. The conference is part of the TI-EVENT-2015, a two day event to bring together the targeted individuals from all over Europe and the world. It aims at creating more awareness on the covert crimes committed against them and humanity. While you are here please consider making a donation for a better world. Thank you.